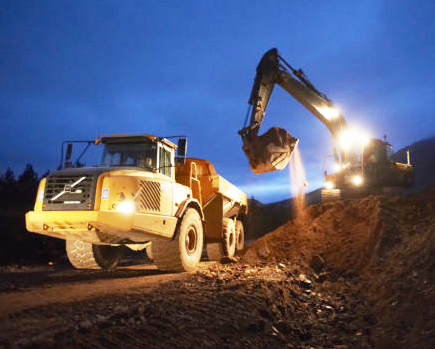 Daviot plant working on the Beauly-Denny transmission line. Daviot Group, the Highland company that last year described itself as one of the fastest-growing civil engineering businesses in the UK, has collapsed with the loss of all 31 jobs. Accounts reveal heavy losses last year with a pre-tax loss of £2.3m against profits of nearly £970,000 in 2015. Turnover had slumped by 26% to £18.86m compared with the previous £25.5m. Separate, consolidated accounts for Daviot Group Holdings show even bigger pre-tax losses of £3.5m compared with profits of £1.5m in 2015. The group, which was sold last autumn by Singapore-based Fasih Rehman to Wyvis Holdings, described itself as one of the fastest-growing civil engineering companies in the UK after expanding into onshore wind, hydro schemes, transmission lines, roadworks and cabling. It had been involved in a number of high-profile projects including the Beauly-Denny overhead transmission line project for which it built more than 50km of access tracks. A spokesman for the liquidator said the holding company itself was not in liquidation, nor was DGL sister company, Daviot Group Plant.